I hope everyone is having a great summer, because I know I am. This past weekend I attended an awesome party and because it was potluck I decided to put some great new recipes to work. I was assigned a "salad" dish and since it was outdoors I had to make a pasta salad that could withstand the summer heat. So I roasted some veggies added some pasta, olive oil, and lemon and developed this delicious Roasted portobello and asparagus pasta salad. Bring water to a boil and cook pasta according to the box directions, drain, and set aside in a large mixing bowl. Add in 4 tbs of olive oil and toss, this will help prevent the pasta from sticking together. Preheat your oven to In 350°F and in a small bowl combine the other 4 tbs of olive oil and mix in the 4 tbs of lemon pepper seasoning to form a paste. Clean and remove the tough bottom part of the asparagus by cutting off an inch of the asparagus ends. Once your veggies are done cooking, cut the asparagus into thirds and slice the mushrooms down the middle and across about 4 times to get nice bite sized pieces. Then add it to the pasta. Add your halved grape tomatoes into the bowl as well and toss the mixture. Now its time to add the rest of your ingredients: lemon juice, pepper, oregano, onion powder, garlic powder, and parsley. Toss the mixture until all ingredients are evenly coated. Serve this dish cold right out of the fridge or at room temperature. Either way it is delicious and will complement whatever you throw on the grill. Summer is a great season for desserts because my favorite fruits are in season. Strawberries being on the top of that favorites list and what's better than strawberry shortcake! 1.Rinse, de-stem, and slice the strawberries and place in a bowl with the 5 tbs of suger. Toss and place in the fridge for at least 30 minutes to help develop the juices and tenderize the strawberries. 3.Slowly add the heavy cream until the mixture is just combined. You don't want the mixture to be too wet, you may not use all of the cream. 5.While they are baking, now is a perfect time to put together the whipped cream. In a bowl combine the 1 1/2 cups of heavy whipping cream, 3 tbs of sugar, vanilla extract and lemon zest. 6.Using a mixer, whip the mixture until soft peaks form. This will take about 2 minutes. 7.Now all you need to do is piece them all together. 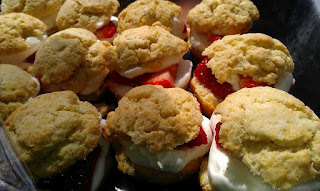 Once the shortcake is cooled, cut them in half. 8.Place some of the strawberries on the bottom, a dollop of the whipped cream, then another layer of strawberries, a dollop of whipped cream and then replace the top. 9.Repeat step 8 until you have filled all of the shortcakes. 10. Place them in the fridge until you are ready to serve them.